Some time ago I thought I could install a wire for short wave operation at my home house. My need for this antenna was that it has to be a endfeed dipole because of my local situation. Also I have only some trees at one direction that I can use for it. Hy End Fed antennas are half-wave antennas that basically work similar to a Zepp or Fuchs antenna. Minimum handling and a relatively high efficiency. The problem with a lot of portable antennas and antennas in confined spaces is the low efficiency of those antennas. Greatly shortened verticals need a lot of radials for higher efficiency, a dipole would need two anchor points and a heavy feed cable in the centre. Usually this is not possible when going on holiday or with only little space to spare. In this case a well known antenna concept like the half-wave antenna helps out. Half-wave antennas can be end-fed, because of that the heavy feed cable in the centre is not necessary and the antennas are easier to install. This way only a light fishing rod on the balcony or a suitable tree next to the house is needed. The greater length (λ/2 instead λ/4) increases the efficiency considerably. Single antennas for lower bands use an extension coil. Another trick by HyEndFed antennas is the transformer (UnUn) with a relatively high transfer ratio of 1:50. Because of that the high impedance of an end-fed half-wave emitter is transformed down to a level with which built-in tuners work well. Sometimes no tuner is needed at all and a counter balance is not necessary either. This is another reason for the antenna design, especially on holiday or with little space. Also, the transformer can cover higher voltage rather easily making HyEndFed antennas capable of higher power. 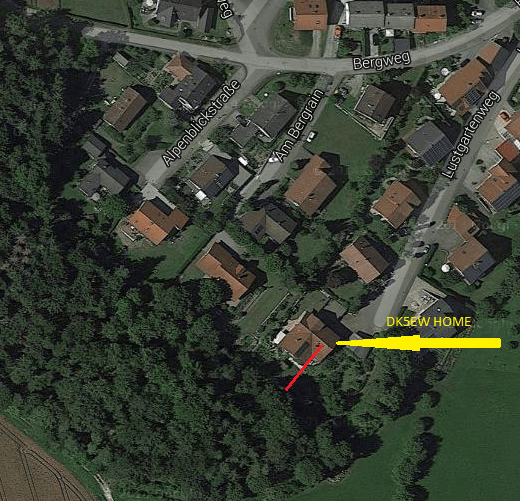 Last week I mounted the antenna on the roof next to a tree and made a measure with my VNA analyzer. The result is very similar like the plot on the WIMO homepage. The on the air result is also very good. I mainly operate in JT65 digital mode and I can work around the world with this nice antenna. As you may see the antenna is nearly invisible for me no problem but maybe interesting for others.